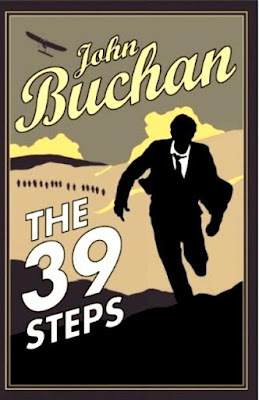 The 39 Steps is basic reading for anyone who enjoys thrillers, preferably first read at about age fourteen. It was written by John Buchan, whose place in the genre was described by Christopher Hitchens thus: "Between Kipling and Fleming stands John Buchan, the father of the modern spy thriller." A new paperback edition has been published in Britain and its cover illustration seemed to me perfect. Ascension Day: Why stand ye gazing up? "Any man who judges by the group is a pea-wit"
In whom do you place your faith? "It depends where you look..."
"By hiding between the covers of a book"
"A tragic shortage of selfishness"